The 2017 NCAA Division III Cross Country Championships are set to begin Saturday in Elsah, Illinois. North Central (Ill.) and Johns Hopkins are the defending men’s and women’s team champions, respectively, while both individual champions – UW-Platteville’s Ian LaMere and Stevens’ Amy Regan – have graduated following incredible careers. This year the women’s 6K race gets underway first at 11 am ET with the men’s 8K contest slated for noon. 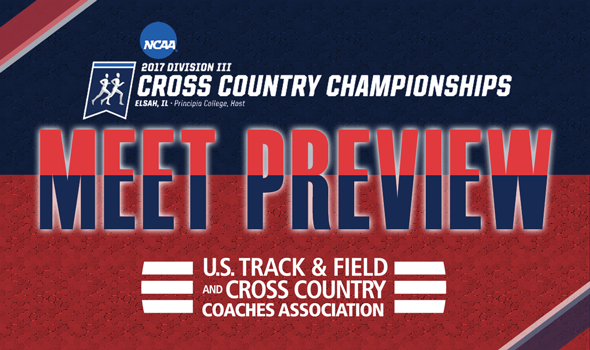 Allow this to serve as a preview of Saturday’s meet as we’ll take a closer look at both team races as well as the individual races. As a reminder, this is the first year that the top-40 finishers in each race receive All-America honors. Who is going to beat North Central (Ill.)? That seems to be the question every year at NCAAs, but this year it’s more pertinent than others. The Cardinals have won 17 national titles dating back to 1975 with four coming since the turn of the decade and look primed to make it 18 and five, respectively, this weekend. North Central (Ill.) has dominated just about every meet in which it competed this season. The Cardinals won by 103 points at the de facto Pre-National Invitational, 59 points at the CCIW Championships (clean sweep) and 47 points most recently at the Midwest Regional. Last year North Central (Ill.) decimated the field at NCAAs. The Cardinals set a point-differential scoring record when they won by 144 points over the rest of the field led by SUNY Geneseo. According to the most recent National Coaches’ Poll, the electorate gave Haverford the best chance at upsetting North Central (Ill.), followed by UW-La Crosse, those aforementioned Knights and Pomona-Pitzer. The Fords earned their stripes this year with a gutsy performance in the Paul Short Gold Race (17th place against NCAA Division I and NCAA Division II opponents) and team titles in the Inter-Regional Border Battle, Centennial Conference Championships and the Mideast Regional. The Eagles went toe to toe with the Cardinals this past weekend at the Midwest Region Championships. UW-La Crosse finished a game runner-up, but couldn’t match North Central (Ill.)’s top-end depth. Both SUNY Geneseo and Pomona-Pitzer raced against the Cardinals at the Pre-National Invitational and finished a distant second and third, respectively. Johns Hopkins has won four NCAA titles in the past five years. The Blue Jays reeled off three in a row from 2012 to 2014 and bounced back from a third-place effort in 2015 to win again last year. According to the most recent National Coaches’ Poll, the electorate picks Johns Hopkins to win another in 2017. The Blue Jays were the unanimous No. 1 in the final poll of the season, which was released Tuesday. Johns Hopkins enters the meet fresh off a victory at the Mideast Regional. It was a decisive win for the Blue Jays (68 points) as they returned Felicia Koerner to the lineup. Koerner had been absent for a few weeks, but finished sixth overall this past weekend as was one of four runners from Johns Hopkins in the top-6. The biggest threats to the Blue Jays are second-ranked MIT and third-ranked SUNY Geneseo. It was back in October at the Pre-National Invitational where the Engineers nearly beat Johns Hopkins. MIT only lost by two points (74 to 76) and trailed by 19 through four runners. That’s when Marissa McPhillips came through in a big way for the Engineers in 28th place. The Knights finished a distant third that day. SUNY Geneseo never found its footing and scored 141 points. Elise Ramirez took 20th overall in that race and has bounced back well since, winning the SUNYAC individual title and placing second at the Atlantic Region Championships. Johns Hopkins is going to be tough to beat with Koerner back in the mix and if they add Natalia LaSpada, too, watch out. Then again, Williams upset the Blue Jays back in 2015 when it was thought that Bobby Van Allen’s team was unbeatable, so we’ll see. This is truly anybody’s race now that Ian LaMere graduated. The top-returning finisher from 2016 is SUNY Geneseo’s Isaac Garcia-Cassani, who took fourth overall. This has been a great season for Garcia-Cassani as he’s won three individual titles, including one at the Pre-National Invitational on this same course. UW-Eau Claire’s Darin Lau took sixth last year and only has one loss to his credit this year (Pre-National Invitational). Lau made it look easy at both the WIAC Championships as well as the Midwest Region Championships this past weekend. No other returning athletes finished in the top-10 last year, but definitely keep an eye out for MIT’s Dennis Maloney, North Central (Ill.)’s Dhruvil Patel and RPI’s Grant O’Connor. Maloney was 12th last year and finished sixth at the Pre-National Invitational. Patel was 18th in 2016 and improved a lot over the past year, finishing runner-up to Garcia-Cassani at the Pre-National Invitational and runner-up to Lau at the Midwest Regional. O’Connor is on a four-meet win streak with his most recent conquest coming at the Atlantic Region Championships at the expense of Garcia-Cassani. Amy Regan might be gone, but there’s another strong front runner who took her place. That would be Taryn Cordani of Ithaca. Cordani is the favorite to win the individual title here as she’s been nothing short of dominant in 2017. The junior from Douglas, Massachusetts won four of the five meets in which she competed and the only loss came in the Paul Short Gold Race where she went toe to toe with some of the best runners in NCAA Division I and NCAA Division II. Cordani won the Pre-National Invitational back in October on this same course by 37 seconds and notched a 19-second win this past weekend at the Atlantic Region Championships. Here’s the thing, though: Cordani only finished 11th last year at NCAAs and there are two other women returning who finished ahead of her in Louisville, Kentucky – Bryn McKillop of Claremont-Mudd-Scripps and Khia Kurtenbach of Chicago. Don’t forget about the aforementioned Koerner or Ellie Clawson from Johns Hopkins or Kaitlyn Mooney from the Coast Guard Academy, who has turned in a standout freshman season with four individual titles under her belt.